Our growing list of satisfied heath care clients demonstrates our sensitivity to the unique demands inherent in health care and dental office construction. We have demonstrated our understanding and effective integration of the complex technical/electronic systems that are often intrinsic to medical settings. In renovation/addition projects, we go out of our way to minimize disruption of services, being sensitive to the safety and privacy of healthcare patients. This project was one of our small renovations where we renovated the sterilization center only. We replaced an existing sterilization center with a Midmark Sterilization Center from Benco Dental. The entirety of the project took only 7 days. This general/family dental practice, led by Dr. Emily Pakula in Candia, New Hampshire is both charming and modern. The office features high-end dental equipment as well as a soothing and appealing green tone throughout. This space was a remodel of an existing dental office. Mann Family Dentistry is now complete! Cobb Hill went in to update the existing dental practice by moving machinery and equipment to make for a more sound place of work. This project was completed during a 6-day shutdown around the Christmas & New Years holidays. Construction is complete for the renovation of an 1800s Victorian home previously used as a medical office. Significant structural alterations were made to accommodate the medical features for this pediatric dental space. Modern materials were used to update this gem from yesteryear. Cobb Hill recently wrapped up construction on an addition and renovation project at Granite Ledges in Concord. The project included construction of a new dining room as well as refinishing the existing dining room. The new addition included a new shingle & rubber roof and Hardi siding. Cobb Hill fully renovated the previous open office space to accommodate for a the new office which features custom stone veneer at the entry of each suite, granite countertops, three unique wall murals, large storage closet, new modern cabinetry and more. Cobb Hill was contracted for extensive renovations to North Hampton Dental Group's office in North Hampton, New Hampshire. The modern design and newly improved space includes a total of 7 rooms: 4 operatories, and 3 hygiene areas. See more by clicking above. Cobb Hill has been contracted by Dr. Anthony J. Ladds, DDS to fit up a new dental office for the practice at 5 Chenell Drive in Concord. The new space is located on the first floor so it required some extensive concrete cutting for the laying of the plumbing. 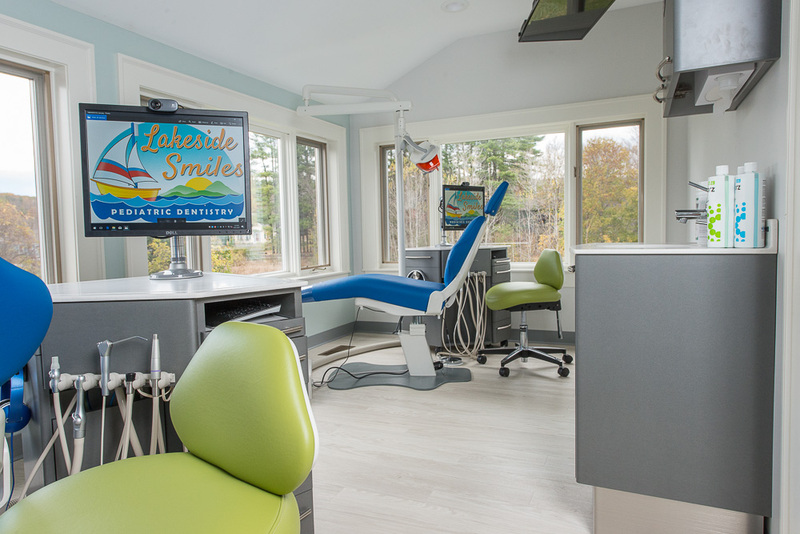 Dr. Adam Bottrill's previous Navy experience is what inspired this wonderful underwater themed children's dental office on the seacoast. The office features a submarine theme throughout as well as interactive games and TVs mounted to the ceiling in each of the operating rooms. Cobb Hill was contracted to build a new ground-up dental office for Dr. JD Howard in Dover NH. The new nearly 5500 sf one story building at 375 Sixth Street in Dover was designed by Warren Street Architects. The modern design includes a total of nine operators. Dr. Posada's office is located in downtown Portsmouth's Bow Street and included the creation of a double operatory room with peaceful views of the river Piscataqua River. The 900 square foot space was renovated for the development of a new Posada Pediatric Dental office. Cobb Hill was contracted by Dr. Anthony Storace to convert empty retail space into a new large upscale dental facility called The Maplewood Dental Group. The extensive project used the 10,000 sqft two floors of space to create a new dental office. Cobb Hill Construction was contracted by New Boston Dental to renovate an old barn to fit their dental suite needs. Throughout construction we were able to keep some of the original pieces, such as exposed beams from the barn, creating a unique office with a lot of character. Concord Pediatric Dentistry is expanding to New London and taking over the space of a former dental office. The practice has contracted with Cobb Hill to renovate the former office on Main Street and improve the systems and infrastructure of the office. This Optometrist Office in Lebanon, NH was transformed by Cobb Hill Construction from a recruiting office for the Army, Navy, Air Force, and Marines to the beautiful space it is today. In order to accommodate the new facility, we demolished the building to its exterior walls before reframing the entire inside to meet specifications.